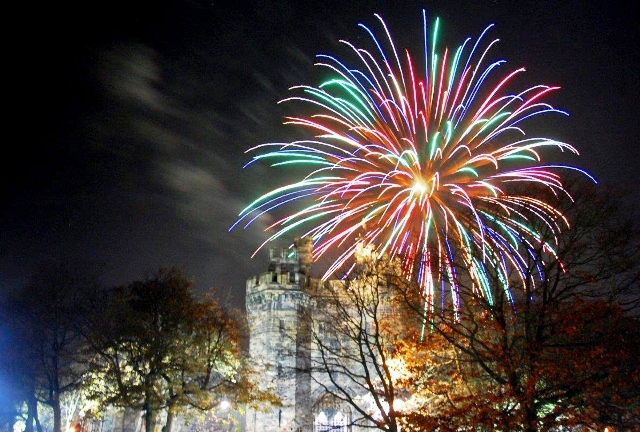 For the past three years, Light Up Lancaster Festival, part of the Light up the North Consortium, has been brightening up the city over the November 5th Bonfire Night weekend. Local and international artists put on lively street performances and virtually every corner of the city has some quirky artwork or show to illuminate the evening. This year’s was bigger and, of course, better than ever. A couple of weeks’ earlier, I’d been to the LightPool Festival in Blackpool, where Steve had created a very different version of When the Red Rose, this time encasing one of the Victorian shelters on the promenade in one huge balloon. I live just 10 minutes away from Lancaster but had never been to Light up Lancaster so I was really excited to see what it was all about. It was fascinating to watch Steve and his team putting up the balloons in the ‘Secret Garden’ at the back of the Storey Institute. They inflated them indoors then brought them outside and attached them to a large metal frame. 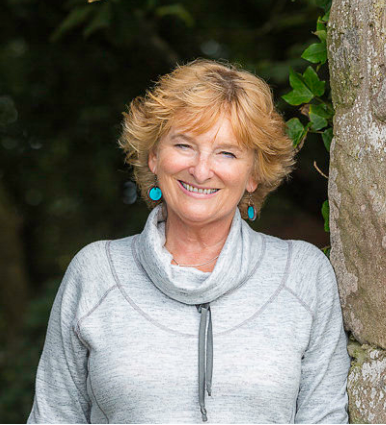 It took a long time to get it all in place but by the time the festival officially started as dusk fell, When the Red Rose – in Lancaster’ was ready for its audience. Meeting up with a couple of friends, we then spent about four hours wandering round the city, finding laughter, light and colour everywhere we went. My favourite was Lock and Key at Lancaster Castle. 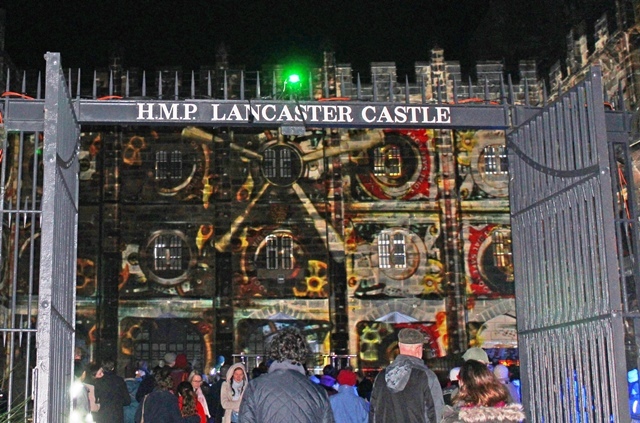 It was a magical Son et Lumiere show projected onto the imposing crenelated walls of what used to be one of HM’s prisons, with pumped up music and audience participation. 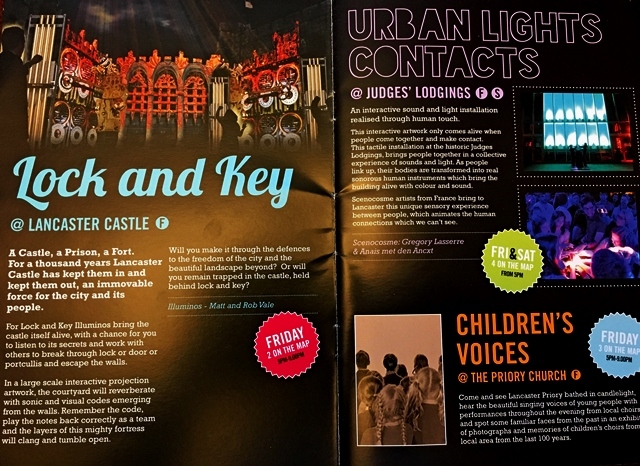 The castle is Lancaster’s biggest visitor attraction and the ideal place for such a dynamic show. 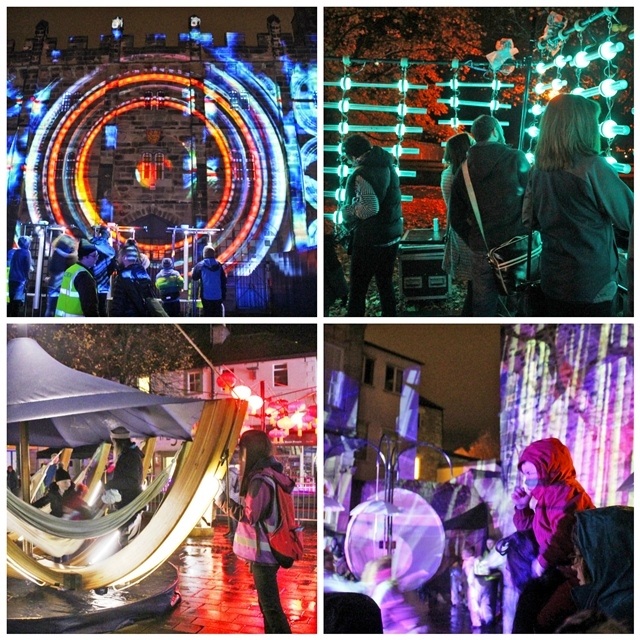 Other highlights included the Illumaphonium, an interactive musical instrument like a giant upright xylophone in front of the Priory and Light Boat in Market Square, a giant wooden structure under a light canopy, promoted as the slowest boat on earth. At Electric Fireworks in the Storey Institute, we shone coloured torches onto a screen and created our own firework display. Cosmic Paranoia was a rather unnerving film of big eyes drifting across the cosmos. One of the most popular interactive installations was LightWeight, where people had their photos taken which were then projected onto a giant revolving globe behind the Museum. Local dancers put on a lively performance called Light Rain in Sun Square; very appropriate as we had intermittent light showers all evening. French artists Scenocosme lit up the Judges Lodgings where people joined together to bring the building alive, though something may have been lost in translation as it seemed to be unlit for quite a time! We were entertained by the Vox Boys Choir in the Priory; an impressive setting for Children’s Voices. The final event of the Friday night was also the most affecting. Recommisioned, by the Dukes Theatre at Lancaster Museum, explored the journey of young soldiers from Lancaster King’s Own Regiment in WWI through light, sound, text and movement. On entering we were each given an envelope representing one of the soldiers, some who lived and many who died. After the very moving performance we opened our envelopes; my young man was a corporal from Millom who’d died in battle. The following night I returned for the Lancaster Firework Display but had time to visit If Boats Could Talk, a charming sculpture floating beside the Lancaster Canal towpath, illustrating the story of migration to the city by a Victorian paver and a Syrian refugee. In Aldcliffe Triangle I met artist Shane Johnstone, who explained its creation and how the children of Dallas Road Primary School designed much of this artwork, as well as the brightly lit lanterns. For the grand finale I joined hundreds of spectators on Quay Meadow, where we were entertained by BBC Radio Lancashire and a very talented musician called Joni Fuller. Bang on 8pm, a rocket soared over Lancaster Castle, music boomed out from the radio tent and we were treated to 20 minutes of spectacular fireworks, a fitting end to a splendid weekend. 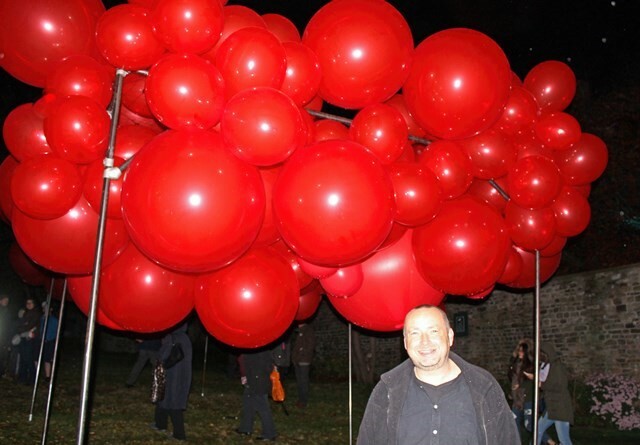 I went along as a guest of Visit Lancashire and Light up Lancaster. It’s really encouraging to see the capital city of Lancashire putting such a vibrant cultural display of light and magic. I’ll definitely be going along next year; hope to see you there! Lancaster just keeps getting better in its cultural and artistic offerings. It’s a small city that now punches well above its weight on many fronts. Now all it needs is a decent department store to improve its shopping credentials! Glad you enjoyed Light Up Lancaster Zoe! We’ve had some great feedback and were pleased with how it all went. There were some amazing artworks and installations and I think people enjoyed the interactive side of things. Here’s to future years getting even bigger and better! Lancaster looks really good all lit up. 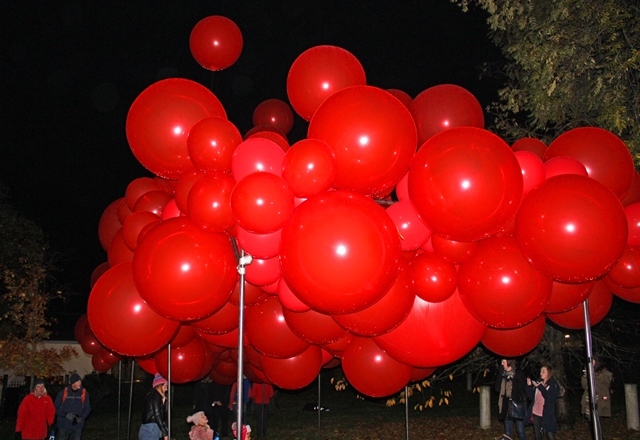 Was ’99 Red Balloons’ playing in the garden?! Ha – very appropriate John 😉 It should have been but Steve said there were about 10 times that amount of balloons!